These healthy pumpkin scones are perfect for sharing over brunch or afternoon tea. Best served fresh and warm out of the oven with lashings of butter on top. These healthy pumpkin scones are my favourite to share with friends and family over brunch. They are easy to pull together with mostly staple pantry ingredients, and are a great way to use up leftover roast pumpkin. I generally roast a tray or two of pumpkin at the start of the week to use in salads and soups. If I haven’t used it all by the end of the week, a batch of pumpkin scones is a must! Scones are one of those curious foods that are shaped differently depending on what part of the world you live. The British way is to make them in a circle shape (and the Aussies inherited this). Americans make them in a triangular shape. There is also some conjecture over whether American scones are sweeter and more buttery than British scones, although without doing a proper comparison I can’t weigh in on that debate. If you’re more comfortable shaping them into a triangle, go for it. It certainly won’t taste any different. These pumpkin scones are refined sugar and egg free, and filled with some good for you ingredients. Treats don’t have to be overly indulgent to be enjoyable. Pull this recipe out next time you are entertaining guests and you’re bound to impress! These scones are created using mostly everyday pantry ingredients. I’ve offered a few suggestions on some substitutions you can make if you don’t have something on hand below. Pumpkin – any roasting pumpkin or squash will work well. I like to use jap or kent pumpkins that are available here in Australia. Wholemeal Flour – OR you could use white all purpose instead. Rice Malt Syrup / Brown Rice Syrup – OR you could use honey or maple syrup instead. Rolled Oats – Traditional rolled oats or old fashioned oats as they are sometimes called. Unfortunately quick or steel cut wouldn’t work well in this recipe. Step 1: Preheat the oven to 180C / 360F. Step 2: Mix together flour, cinnamon, baking powder, salt and sultanas in a large bowl (photo 1). Step 3: In a seperate bowl, combine mashed roasted pumpkin, rice malt syrup, vanilla essence and butter and combine (photo 2). Step 4: Add wet ingredients with dry ingredients and combine together lightly with your fingers until the dough just combines (photo 3). Step 5: Scatter some rolled oats onto a clean counter or cutting board, and place your dough on top. Flatten the dough until about 5cm thick and scatter some rolled oats on top of the dough too. Step 6: Using a scone cutter or the mouth of a small glass, cut the dough into rounds and place on baking tray. Be careful not to twist the cutter – just push straight down and pull straight up (photo 4). Step 7: Bake for 15-20 minutes until cooked through and golden. Step 8: Cool on a rack for 5-10 minutes and serve with lashings of butter. Over-mixing causes the scones to be dense and chewy, and scones are at their best when they are light and fluffy. Work the dough until it *just* comes together, and a few lumps or bumps are fine. If you’re using a scone cutter, push straight down and pull straight up. Twisting the cutter will result in an unevenly risen batch of scones. Bake them just before serving. Scones really are best fresh out of the oven. If you’re wanting to get a head start, make the dough and refrigerate until you are ready to bake. 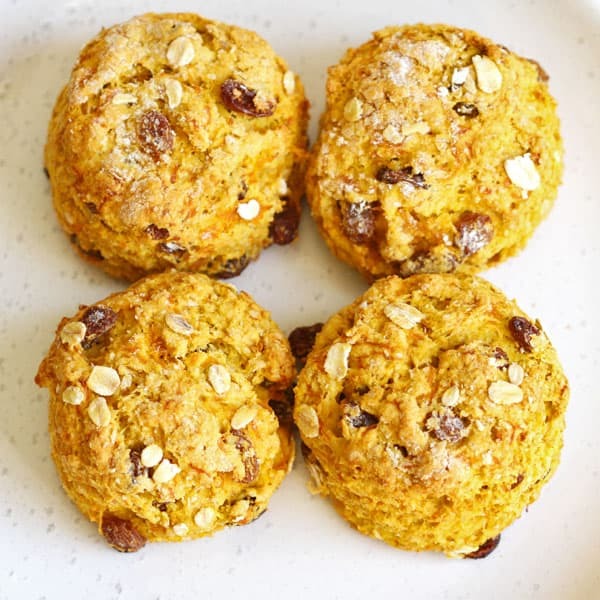 If you’ve tried these Healthy Pumpkin Scones I’d love to hear how you enjoyed them! Pop a comment and a star rating below! You can also FOLLOW ME on FACEBOOK, INSTAGRAM and PINTEREST to keep up to date with more delicious recipes. Preheat oven to 180C / 360F. Mix together flour, cinnamon, baking powder, salt and sultanas in a large bowl. In a seperate bowl, combine mashed roasted pumpkin, rice malt syrup, vanilla essence and butter and combine. Add wet ingredients with dry ingredients and combine together with your fingers until a dough forms. Scatter some rolled oats onto a clean counter or cutting board, and place your dough on top. Flatten the dough until about 5cm thick and scatter some rolled oats on top of the dough too. Using a scone cutter (highly recommend) or the mouth of a small glass, cut into rounds and place on a baking tray. Be careful not to twist the cutter - just push straight down and pull straight up. Bake for 15-20 minutes until cooked through and golden. Cool on a rack for 5-10 minutes (if you can wait that long) and enjoy with some lashings of butter. Adapted from The Healthy Chef. Use any good roasting pumpkin or squash. My favourite varieties here in Australia are jap or kent. To make the Roasted Pumpkin mash, just cook small pumpkin slices covered in 1tbsp olive oil in the oven at the same temp for 20-30 minutes until softened. Mash and allow to cool before using in the scones. I generally batch roast a tray or two of pumpkin at the start of the week to use for soups, salads and these scones. 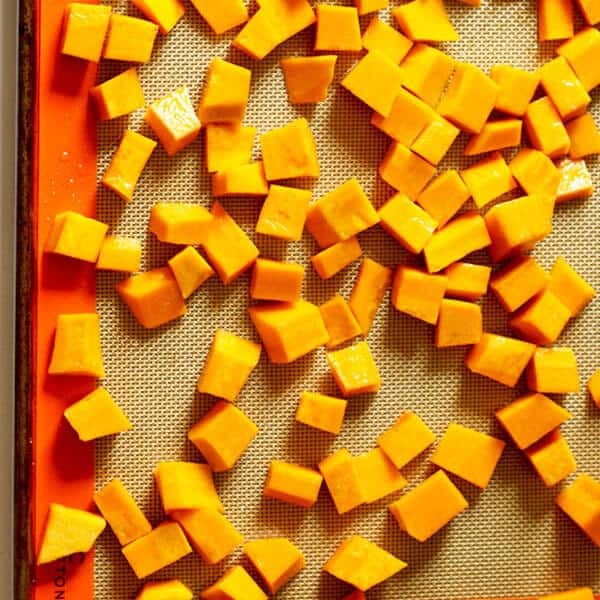 It cuts down prep time and pumpkin can be used in so many ways. If you're using a scone cutter, push straight down and pull straight up. Twisting the cutter will result in an unevenly risen batch of scones. Scones really are best fresh out of the oven. If you're wanting to get a head start, make the dough and refrigerate until you are ready to bake. Shape the dough however you like! Aussies make them round, but I know Americans prefer wedges! They will taste the same regardless! Recipe was first published December 12, 2017. It was last updated December 17, 2018, with new photos and tips. No changes to recipe. Nutrition information is a rough estimate based on one scone. I’ve never tried that one! But it looks good and healthy at the same time. I would love to try your fantastic recipe! These look delicious! we will try it in our rasoie for our online customer. love from India. I love scones. I can’t wait to try out this recipe with my kids during the Christmas break. It sounds delicious and then healthy what more could you ask for. Hope you like them Lisa! Really Janella? Traditional scones are delicious too! With a dollop of jam and cream! I love scones with either coffee or tea and pumpkin version would be awesome especially if it’s healthy! This recipe looks great and it’s perfect for the season! A cup of tea and a scone – perfect! I think your aunt and I would get along! Pumpkin and scones. That’s my kind of breakfast. A little tweaking and I can make them gluten free. Absolutely delish! I’ve never heard of pumpkin scones before! I’d love to give this recipe a bash, I’m sure my tummy will be very happy! 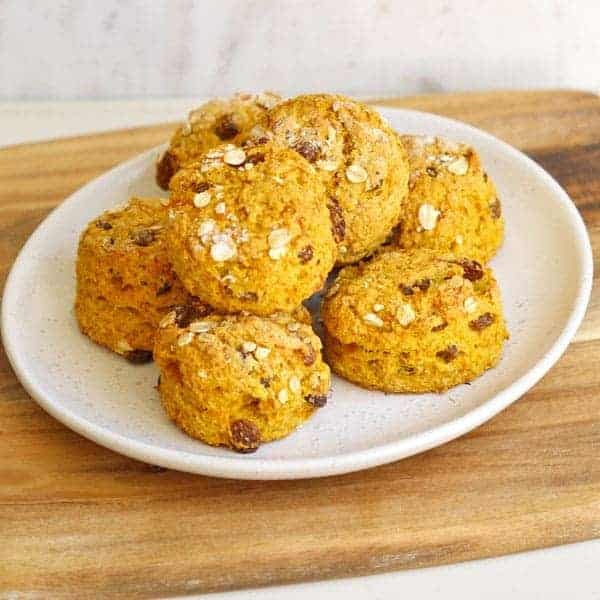 They are pretty popular here in Australia – much like a regular scone but with delicious pumpkin! 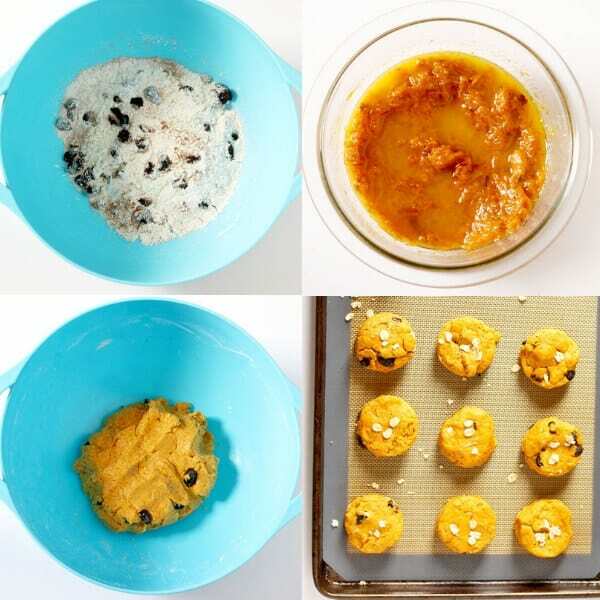 You can’t beat a 30 min healthy cookie! Thanks so much for sharing, I haven’t tried these before. With all the Holiday cookies around Ill be sure to add these in!! Hey Tonya – these are scones, not cookies – just don’t want you to make them and expect them to taste like cookies! Still worth a bake! These look delicious! My boys love pumpkin-flavored anything, I’ll have to try these. I have never heard of Sultanas and now it’s definitely something I want to try. Scones are such a great breakfast food! They are just like raisins but just dried a little differently. Raisins would taste just as good 🙂 Scones are absolutely the perfect breakfast food! These look delicious! I’d love to have them with tea. And I do need a baking win, I’ve had one cookie disaster after another lately!